The term “best accessory for gaming” is too broad for us to just choose one. 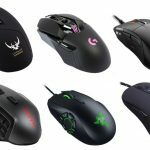 There are quite a few different “types” of accessories (of course, aside from your complete necessities, like gaming mice, gaming keyboards and gaming headsets). 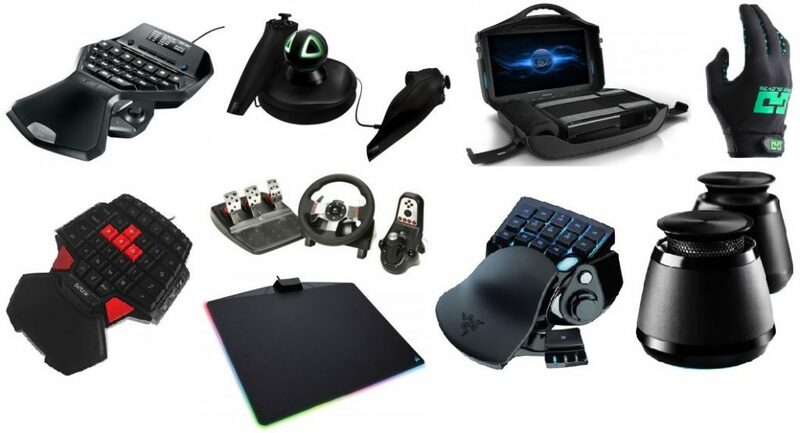 We did our best below to find the best gaming accessories that span across multiple uses, types, or even perhaps accessories you didn’t know existed to help you see what else is out there that may help you step up your game (or experience, rather). 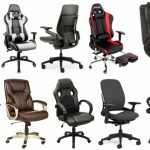 Here are some types of accessories for gaming you should look out for: game boards (which allow for a lot more shortcuts and hotkeys aside from your keyboard if you need some more versatility and better work flow), lightning for a better gaming aesthetic, gloves for better grip, speakers, specific accessories depending on your game type (such as steering wheels and pedals for car games, etc.). Those are just a few, so let’s get into the picks now. 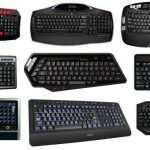 To begin, we have a solid, durable, and easy to use G13 Gameboard by Logitech that includes just about everything you need to in an advanced gameboard and makes its way as our pick as the best gaming accessory. Regardless of your ‘playing level’ — leagues, for fun, or somewhere in the middle, the G13 features everything you need and allows the user to have the ability to configure up to 75 unique functions as well as various different modes per key. The gameboard also comes with a programmable mini joystick to help maneuver your actions quickly at the movement of your thumb. This is one of the best gaming accessories for experienced users since it helps give you the ability to optimize your function access with a comfortable gameboard to also enable you to play more continuously without fatigue. Comfort in your gaming is paramount as we all know, so allow the naturally contoured G13 design to follow the shape of your fingers and enable you to play for hours on end. 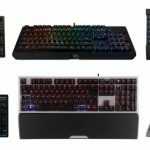 The Logitech G13 Gameboard is a high-quality accessory for gaming that will not only bring your game flow to new heights for quicker access to hot keys you need while you play, but is super comfortable and comes with custom-color back lighting for an added aesthetic factor as well. It’s not too expensive, either. 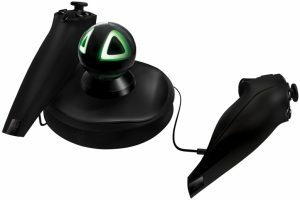 The Razer Hydra brings gaming to new heights as it is one of the best gaming accessories on the market today if you’re into a more hands-on approach like the Wii, and especially a game like Portal 2. Forget about your common Xbox or PS4 controller, the Hydra brings a new outlook on high-tech gaming. Utilize the controllers magnetic motion sensing for the best possible technology driven result, not to mention its ultra-low latency for increased accuracy and precision. Totally lose yourself in your game as this compact controller allows you to better interact and move in ways a controller just can’t really manage. Whether you’re attacking the rim in NBA 2K or throwing a grenade in the heat of battle, this controller gives you a more intuitive way to attack the opposition and lets you feel comfortable as well. This controller is versatile and easy to use for over 125 of the most popular PC games. If you’re looking for an easy way to upgrade your gaming experience, the Razer Hydra is a great start if it suits your preferred game(s) well. Vanguard’s GAEMS is a nifty little all-in-one and versatile package for gamers. Now you don’t have to ever be without your gaming system as this personalized gaming environment now lets you simply pack and commute from location to location without your system. 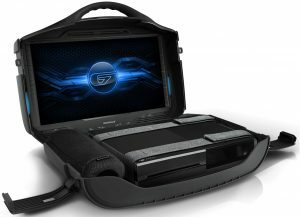 Whether you are traveling or simply enjoy playing during idle time outside, the GAEMS is not only TSA friendly, but is comfortable and relatively light weight at around 10 lbs. on top of it all. Simply plug and play and lose yourself in your games just as if you were in the comfort of your own home. The GAEMS comes with a PGE sling, PGE remote as well as a storage bag. There’s also a non-reflective 19″ 720p display and headphone jack to keep the experience private. Compatibility includes Xbox One, 360, PS4 and PS3 Slim. If you’re like us and can’t live without your games, let the GAEMS Vanguard disallow you from ever having that problem again. It’s safe to say that this is up there with some of the best gaming accessories on the planet. It’s OK to admit that sweaty hands are a thing, especially if you’re like us a binge-play for hours through the night. We were new to the concept of ‘gaming gloves’ as well, but let’s give it a try or keep an open-mind for now. Made by gamers themselves, the EPG is a great additional accessory for your optimal gaming performance and one of the best gaming accessories for your play if grip can give you an edge over opponents. The gloves contain moisture wicking material that keep you completely in control of your controller and remove the possibility of having a bad result due to slippage. 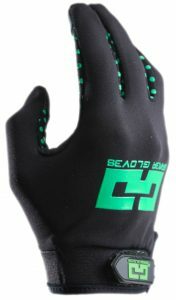 Cool and comfortable, these gloves are simply a no brainer when it comes to optimizing your play, not to mention look really cool. The EPG come with an isometric rubber grip to eliminate potential joystick slipping as well as missing your mark. Video game systems are not perfect, and mistakes do happen, so if you are looking to minimize your mistakes and get it right, gamer gloves will certainly halt. Equipped with four-direction stretch design enables provided full hand range of motion. Certainly not a necessity, but the little things do matter, and the Gamer Gloves EPG will not only ensure full functionality for your PC, Xbox or PlayStation play, but will benefit game play on your mobile devices as well. 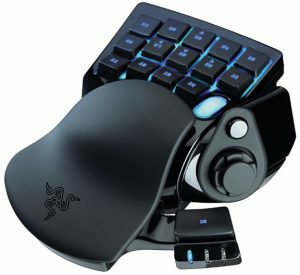 Another highly intuitive and well-designed keypad, the Razer Nostromo is the best of the best and certainly another one of the best gaming accessories in the market. This 16-button keypad layout and form factor is ergonomically optimized and allows you to better take control of your game play. In addition, if you are a binge video game player that appreciate long sessions, this is a gaming keypad that is built for comfort that will eliminate fatigue. Featuring a soft-touch rubberized wrist pad that allows you to comfortable place your hands you will never experience hand fatigue or strained wrists again. On the fly key map switching enhances your ability to better direct your game as well as instantaneously switch between 8 key maps by assigning each key map toggle to any button you desire. When it comes to high-quality gaming there is only so much that you can choose from to truly enhance your play. 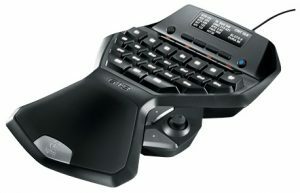 It’s no secret, however, that a rock-solid gaming keypad such as the Razer Nostromo can make all the difference. The era of arcade play is perhaps coming to an end. The G29 Racing Wheel is a powerful dual-motor force feedback wheel that also contains helical gearing that helps create traction loss. 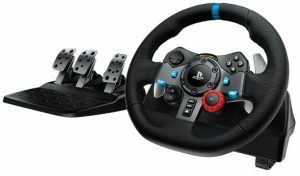 There is nothing to exaggerate about — this is a racing wheel that makes you feel like you are behind a race car as opposed to handheld controller. Six speed shifters allow the user to have a real-life driving experience with push-down reverse gear to enable a quick choice for the optimal gear. This is a realistic wheel that provides steel, gas, brake and clutch pedals to deliver heart beat skipping full throttle. The steering is of great material and comes close to emulating a real-life leather wheel. If you are a serious gamer and enjoy playing car games, the Logitech G29 is a great choice if you are looking for a real-life wheel that has all the necessary functions to deliver the most realistic experience. Keep in mind it’s only compatible for PS3 and PS4. Up next is yet another game board, however we really liked this one in the middle of our guide due to the combination of affordability, functionality and its overall user reviews. You have a nice ergonomic design, four groups of special keys, a convenient middle row, LED back lights, additional F and number keys, as well as a little comfortable wrist rest pad. We’d assume you’ll put it next to your mouse or keyboard hand (we’d prefer to the left of our keyboard since we’re righty). It isn’t anywhere near the quality of the previous Logitech or Razer pads, but it can get the job done for nearly half the price of those. 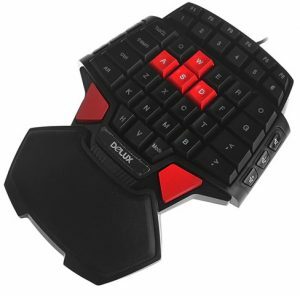 The Delux T9 46-Key is another game pad that will help with game flow and access to hot keys at a super low-price — it could even be an add-on with any other accessories in here to give you that much more of an edge to your play. For those mobile gamers out there, don’t look too far for your next great gaming accessory. The Ferox is a cheap and nice audio reference that is going to take your mobile gaming to the next level. It is equipped with a 360 degree omnidirectional sound for clear audio as well as a digitally enhanced amplifier for even further efficiency and power. This is a compact speaker system that offers an increased sound quality but it’s even better known for its powerful bass. If you need a break from headphones. the expanded bass resonance chamber makes for an even more explosive sound that will without a doubt amplify your FX for greater distance and just a superior gaming experience overall. 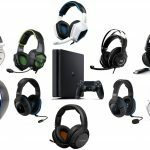 The audio quality isn’t worth replacing your computer speakers for this one, so if you’re only gaming on your PC at your desk, it’s not worth the buy. 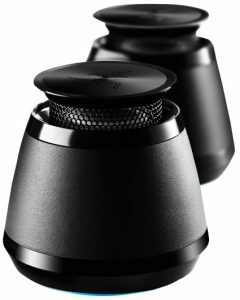 However, what makes this one of the best gaming accessories in the market and a no-brainer when it comes to gaming speakers is if you’re on-the-go or on a laptop somewhere other than your desk, such as your living room, patio, etc. When it comes to great speaker systems for gaming at this particular size, it’s hard to find something stronger than the Razer Ferox. Anybody here a fan of lights? Gear up and make your gaming experience even more attractive and fun. 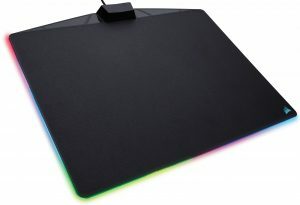 This LED lighting gaming mouse pad allows you to work or play with some fluorescent colors to keep you on top of your game. 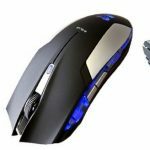 You have 15 zone RGB LED customizable lighting, a built-in USB port that passes through for your mouse, as well as low-friction and micro-textured surface gives us a quick and easy tracking ability. Not to mention underneath is an anti-slip rubber base to keep it sturdy on your desk. This is a hard, micro textured mouse pad that will heighten your accuracy and minimize any chance of mistakes. Enabling the user to have the perfect surface for more than just a good-looking mouse pad, the Corsair MM800 POLARIS is hands down one of the best gaming accessories for computer gaming out there if you want more speed to your hands as well as an overall beautiful look. Last but not least, let’s look into something many of us (fine, we’ll speak for ourselves) lack at times with all of this gear — organization! 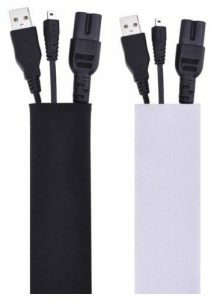 Coming in as super cheap and more of a “why not?” purchase for a gaming accessory, let cable dangling annoy you no more as cable management sleeves are the perfect choice for maintaining your clutter behind and below that desk. Although it won’t affect your gaming skills or even gaming flow, you’d be surprised at the psychological aspect of disorganized clutter in our gaming space — for us, at least. Form-fitting neoprene stretchy material enables the user to contain multiple cables under the same sleeve. As most are fit to hold anywhere between 8 to 10 cables, this is a necessary accessory if you are serious about having a neater gaming environment. It’s honestly up to the person, considering we know a lot of gamer friends who could care less about the look and feel of their desks, while others such as us feel being as neat as we can goes a long way. If you are also a fan of mounting your television set to the wall, this is a great product for keeping your chords organized so that you don’t find yourself dealing with a cluster when people are over. Simply wrap your Cable Management Sleeves, zip them up, and utilize them with ease. As many of them are ten to fifteen bucks a pop, we’d say just add them to cart before you checkout.